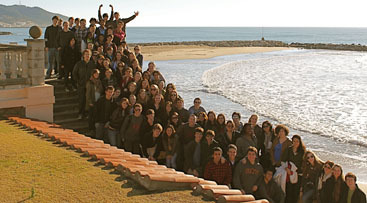 ON THE ROAD: During their recent trip to Catalona, the PHS choir stopped to pose for a group shot. They were en route to the Pau Casals Museum and Music School, named for the acclaimed cellist and composer. One pastor said that the walls of his church would never be the same after being touched by our music, reported Princeton High School (PHS) Choir Associate Director Sarah Pelletier, describing just one of the many appreciative comments the group received on its recent tour to the region of Catalonia, Spain. The Princeton Environmental Commission (PEC) reviewed developer J. Robert Hilliers proposed development on Princeton Ridge, Princeton Universitys proposed Arts and Transit Neighborhood plans, and storm water and stream buffer ordinances at their meeting last week. I think you can tell that Im enamored of the place, said writer Linda Arntzenius in a recent interview about her new book, Images of America: Institute for Advanced Study. Published by Arcadia Press, the heavily illustrated history is already available for sale at Labyrinth Books, Landaus, and online through Amazon. In addition, Ms. Arntzenius will be signing copies of the book at two upcoming Princeton Public Library events, on March 12 and 19. “Lasting Impressions of the Grand Tour: Giuseppe Vasi’s Rome” will open Saturday, March 5, at The Princeton University Art Museum, where it will be on view through June 12. “When Men and Mountains Meet: China as Land and People” also opens on March 5 and will be up through June 26. Rome in the 18th century was the ultimate goal for upper-class visitors from Northern Europe and especially Britain, where the term “the Grand Tour” first appeared in print in the late 17th century. Of the numerous contemporary artists in Rome who catered to the demand for mementos of the Grand Tour, the printmaker Giuseppe Vasi (1710-82) was one of the most prolific and affordable, producing etchings that were either individually framed or displayed in bound volumes.